In 1816, the kingdom of Württemberg was in dire straights. Crop failures had ravaged the state and caused famine throughout. In 1817, when the first harvest was again able to be brought in, the royal couple funded an agricultural fair in Cannstatt. It is still celebrated today. Drawing of a May bug. MAY BUGS AS "SPLENDID NOURISHMENT"
May bug soup was one of a few insect dishes consumed across Europe and was a familiar dish in Germany until the mid-20th century. 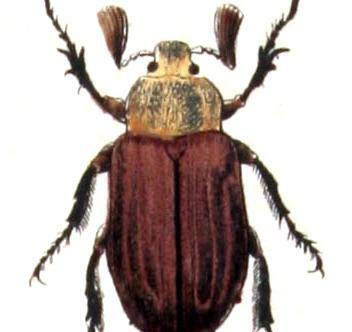 In an 1844 copy of Magazin für Staatsarzneikunde (Journal of State Pharmacology), the May bug is touted as "splendid and hearty nourishment". To prepare, the legs and wings of the beetles had to be removed and roasted before being boiled. The soup utilized creatures, which were, in some years, a considerable pest, as a natural resource that was both free and available in large quantities. The taste was said to be similar to that of crayfish soup. The royal couple's final resting place on Württemberg hill. Even recipes like these could not save the people of Württemberg from starving. The eruption of a volcano in Indonesia in 1815 caused climate change for years to come, even as far away as Central Europe. The winter of 1815/1816 was the coldest on record. Crop failures in subsequent years caused famine across Württemberg. The royal couple, Wilhelm I and Katharina, made every effort to alleviate the hardship in Württemberg while simultaneously modernizing the state. Animal prizes at the fair in Cannstatt, 1824. By funding the agricultural fair, which was to be celebrated every year on September 28, the king's birthday, the royal couple hoped to promote new and updated agricultural practices within their kingdom. They did so with an award for excellent agricultural practice at the first Cannstatt fair. What's more, the first fair in 1818 was attended by more than 30,000 visitors (the chief administrative city of Cannstatt only had a population of 3,000). It remains the second largest fair in the world to this day. The school at Hohenheim Palace. At the same time, the royal couple founded an agricultural school at Hohenheim Palace, which formed the basis for the current agricultural college. The two-furrow plow was invented there, for example. During King Wilhelm I's 48-year reign, Württemberg shifted from an agrarian state to a constitutional state with a communal identity and elaborate administrative system.